Conrad Hilton was born in San Antonio, New Mexico. His father, Augustus Halvorsen Hilton, was an immigrant from Norway and his Catholic mother, Mary Genevieve (née Laufersweiler), was an American of German descent. Hilton grew up with seven siblings: Felice A. Hilton, Eva C. Hilton, Carl H. Hilton, Julian Hilton (died in infancy), Rosemary J. Hilton, August H. Hilton and Helen A. Hilton. Hilton attended the Goss military (New Mexico Military Institute), and St. Michael’s College (now Santa Fe University of Art and Design), and the New Mexico School of Mines (now New Mexico Tech). He was a member of the international fraternity Tau Kappa Epsilon. In his early twenties, Hilton was a Republican representative in the first New Mexico Legislature, when the state was newly formed. He served two years in the U.S. Army during World War I. His father was killed in a car accident while he was serving in the Army in France. The most enduring influence to shape Hilton’s philanthropic philosophy beyond that of his parents was the Roman Catholic Church and his sisters. He credited his mother with guiding him to prayer and the church whenever he was troubled or dismayed — from the boyhood loss of a beloved pony to severe financial losses during the Great Depression. His mother continually reminded him that prayer was the best investment he would ever make. As a young boy, Hilton developed entrepreneurial skills working at his father’s general store in Socorro County, New Mexico. This was followed by varied experiences, including a stint as a representative in New Mexico’s first State Legislature and a career decision to become a banker. It was with the intention of buying a bank that he arrived in Texas at the height of the oil boom. He bought his first hotel instead, the 40-room Mobley Hotel in Cisco, Texas, in 1919, when a bank purchase fell through. The hotel did such brisk business that rooms changed hands as much as three times a day, and the dining room was converted into additional rooms to meet the demand. He went on to buy and build hotels throughout Texas, including the high rise Dallas Hilton, opened in 1925; the Abilene Hilton in 1927; Waco Hilton in 1928; and El Paso Hilton in 1930. He built his first hotel outside of Texas in 1939 inAlbuquerque, New Mexico, today known as the Hotel Andaluz. During the Great Depression Hilton was nearly forced into bankruptcy and lost several of his hotels. Nonetheless he was retained as manager of a combined chain, and eventually regained control of his remaining eight hotels. Over the next decade he expanded west to California and east to Chicago and New York, crowning his expansions with such acquisitions as the Stevens Hotel in Chicago (then the world’s largest hotel), and the fabled Waldorf-Astoria in New York. He formed the Hilton Hotels Corporation in 1946, and Hilton International Company in 1948. During the 1950s and 1960s, Hilton Hotels’ worldwide expansion facilitated both American tourism and overseas business by American corporations. It was the world’s first international hotel chain, at the same time promulgating a certain worldwide standard for hotel accommodations. In all, Hilton eventually owned 188 hotels in thirty-eight cities in the U.S., including the Mayflower Hotel in Washington, D. C., the Palmer House in Chicago, and the Plaza Hotel and Waldorf-Astoria in New York City, along with fifty-four hotels abroad. He later purchased the Carte Blanche Credit Company and an interest in the American Crystal Sugar Company, as well as other enterprises. Hilton received honorary degrees from the University of Detroit (1953), DePaul University (1954), Barat College (1955), Adelphi College (1957), Sophia University, Tokyo (1963), and the University of Albuquerque (1975). Hilton’s autobiography, Be My Guest, was published in 1957 by Prentice Hall. 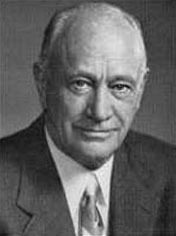 In 1966, Hilton was succeeded as president by his son Barron and was elected chairman of the board. In 1925, Hilton married Mary Adelaide Barron (d.1966). They had three children: Conrad Nicholson “Nicky” Hilton, Jr., William Barron Hilton, and Eric Michael Hilton, before divorcing in 1934. In 1942, Hilton married actress Zsa Zsa Gabor. They had one child: Constance Francesca Hilton, before divorcing in 1946. Gabor wrote in her 1991 autobiography One Lifetime is Not Enough that she only became pregnant by Hilton after he raped her during their marriage. In 1976, Hilton married Mary Frances Kelly. Their marriage lasted until his death in 1979. Mary Hilton died in 2006. In 1979, Hilton died of natural causes at the age of 91. He is interred at Calvary Hill Cemetery, a Catholic cemetery in Dallas, Texas. He left $500,000 to each of his two surviving siblings and $10,000 to each of his nieces, nephews and to his daughter Francesca. The bulk of his estate was left to the Conrad N. Hilton Foundation, which he established in 1944. His son, Barron Hilton, who spent much of his career helping build the Hilton Hotels Corporation, contested the will, despite being left the company as acting President, Chief Executive Officer, and Chairman of the Board of Directors. A settlement was reached and, as a result, Barron Hilton received 4 million shares of the hotel enterprise, the Conrad N. Hilton Foundation received 3.5 million shares, and the remaining 6 million shares were placed in the W. Barron Hilton Charitable Remainder Unitrust. Upon Barron Hilton’s death, Unitrust assets will be transferred to the Hilton Foundation of which Barron sits on the Board of Directors as Chairman. On December 25, 2007, Barron Hilton announced that he would leave about 97% of his fortune (estimated at $2.36 billion), to a charitable unitrust which would eventually be merged with the Conrad N. Hilton Foundation. By leaving his estate to the Foundation, Barron not only donated the fortune he had amassed on his own, but also returned to the Conrad N. Hilton Foundation the Hilton family fortune amassed by his father, which otherwise would have been gone to the Conrad N. Hilton Foundation 30 years previously had Barron not contested his father’s will.